We’re excited to announce that for the month of January we’re partnering with Metcalfe’s Market to earn money for our organization and give you a discount! Use this coupon to save 5% off your grocery purchases anytime, all month long. And not only will you save – but at the end of the month Metcalfe’s will donate 5% of all our neighborhood member purchases back to us. 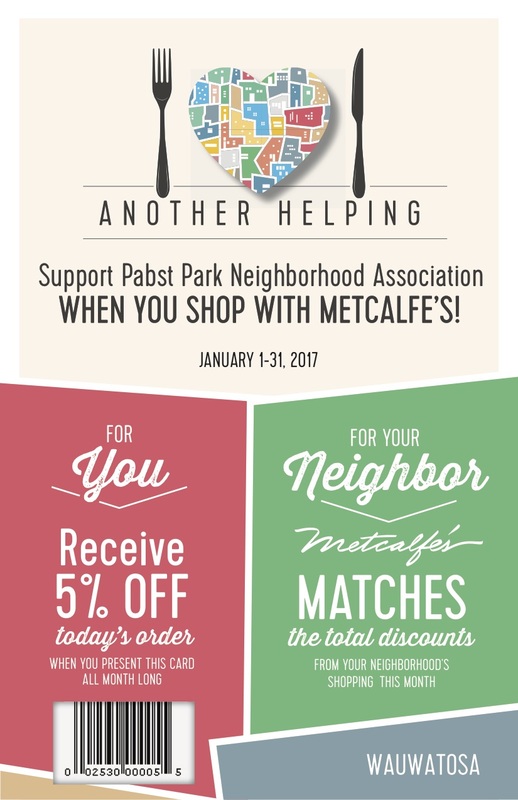 Present this coupon (printed or on your phone) at checkout in January anytime to save 5% on groceries, and then Metcalfe’s will donate that 5% to the Pabst Park Neighborhood Association. Win-win! We will use the proceeds of this fundraiser to move forward with our neighborhood sign project, more info, here. We still need to form a committee of neighbors interested in taking the lead on this project. The first hurdle, fundraising, could be easily cleared by Metcalfe’s generosity. Please let me know if you are interesting in helping with the street sign project via email.